Alcohol Measurement by Refractometer and Hydrometer. 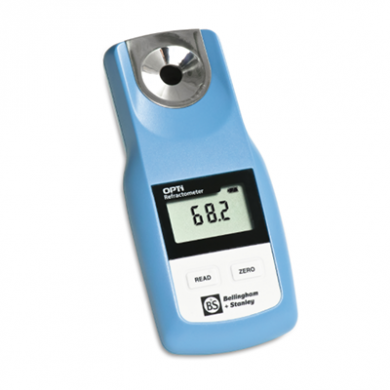 The alcohol content of a beer, wine and cider may easily be established by combining the results of two simple test measurements, that of a refractometer (RI-Zeiss) and a hydrometer (SG). Calculation of results is by way of either a paper lookup table supplied with the refractometer or by a simple Internet calculator that can be accessed via a networked PC or web enabled mobile phone. Only a few drops of sample are needed to make the refractometer reading, while the S.G. is measured in the usual way with the hydrometer jar. The process takes only a few minutes to carry out and an accuracy of about 0.5% alcohol can be obtained using reasonable care in ensuring that both readings are made at the same temperature. If the instrument is used with care and cleaned as recommended after use, it should give many years of accurate and trouble-free service. Siphon off enough of the finished sample to fill the hydrometer jar to required level and leave all the equipment with it in a place free from draughts and direct sunlight for at least an hour to attain room temperature. Measure the S.G. as accurately as possible and record. Measure the refractive index of the sample in Zeiss units using the Wine refractometer. Please contact us if you require a model we are not showing on our website.